Since there's a few of us now who watch her and I have a feeling she'll be having lots of life updates, I'll go ahead and make a thread about her. For anyone new/unaware: she's a 25 year old vlogger /personal trainer in the UK who has cancer, and just got engaged to her girlfriend. Just quoting this one over from the 'other youtubers' thread. I got into Emily's vlogs thanks to recent posts in the Other YouTubers thread as well and I'm just amazed at her strength and positivity. Her and Aisha are a beautiful couple, I'm so happy about their engagement. I'd been feeling really, really sad about Emily's latest results so I literally cried when I saw the picture on insta. Such a beautiful couple inside and out. I've never missed a video of hers since Hector introduced her to us on twitter. Before the last few videos, she was so positive it's getting better, so the news feels so unfair. I'm glad people in the youtube comments are asking her to open a gofundme so we can sponsor her "end of life fun" as she called it. She hasn't said she would do it (and I'd understand if she wouldn't) but I'd want to donate as well if she would. I'm also torn now that this is seemingly inevitable. Like @alien said in the Other Youtubers thread, doesn't it feel morbid to be subscribing to her now? Are we sick counting down the days with her in a sense? But I just feel like I'm not ready to say goodbye to my friend yet. I see what you're saying, but I don't think it's a bad thing. Since her early videos, she's always said how happy it makes her when people subscribe and like her videos. She's proud of the videos she puts out, and she wants people to watch and enjoy them, even when the subject matter isn't all that happy. I don't think there's anything wrong with continuing to watch her videos, or even new people that are just subscribing now. I think she appreciates the support. And yes, the subject matter is really sad atm, but she and Aisha are also such strong, uplifting people, that in a way it's almost a positive thing to watch? I don't know if I explained that right, because obviously the whole thing is devastating - but they're also very inspiring at the same time. I wish them both all the best, and hope that things work out somehow. I can understand that view of it, but the way I look at it is that vlogging has been a huge focus for her now that she can't work. She wants her audience to grow, she wants to make these videos for people, she wants that interaction. She wants to have a focus and be productive and see results for that productivity. She wants to inspire people, and she's doing a really good job of it. I really hope she sets up a gofundme because I'd definitely donate to that! I do find her videos incredibly inspiring especially as someone who's struggled with a chronic illness for the last 11 years of my life. But at first I really did question why I wanted to start watching her now. But like alittledizzy said Emily wants an audience and youtube has given her something to focus on which can definitely be a big help. I'm a puddle of tears they are so sweet. I'm very non-religious but they've got me praying to someone/something for a miracle for her. That was so adorable I really hope they get to spend much more time together than doctors predict! Thanks to @alittledizzy for telling me about Emily, I am really enjoying watching her vlogs. Nice to see that her subscriber count is increasing every day too, you can really see how happy that makes her. Her and her fiancee are the cutest, I almost cried watching them get engaged. In the video from today she showed opening mail and I was wondering if anyone knows if she has a PO box or an address to send stuff to? I looked in the description of a couple of her videos but I don't see one. Anyone know? God, she has such a positive outlook - and I'm so thrilled they've got a plan of action now and it's exactly what she wanted/hoped for. 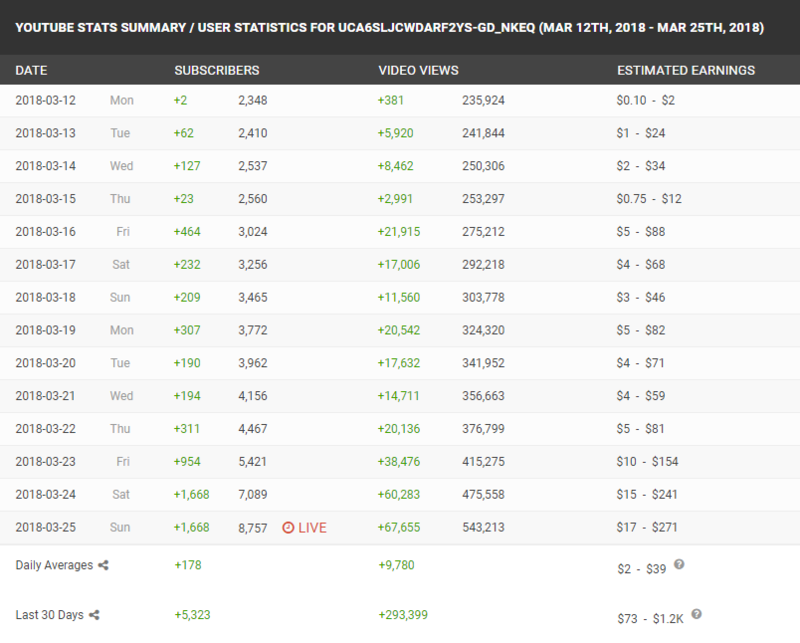 Wow her sub count has been skyrocketing these past few days. I'm really happy for her, you can really see how passionate she is about her vlogs. I've just now started watching her vlogs from the beginning in February 2016. (That's what I do with any YouTuber I like! that's how I got here!) Some of her early videos literally have fewer than 200 views. It's the same Emily, just a little less polished with the editing, and it helps fill in the backstory of her journey, as well as flooding the viewer with her amazing positivity. Her early videos also have quite a bit of footage of her training in the gym, which is interesting but can easily be skimmed through if you're not into that. I'm so sad for her and Aiysha about the latest results but I do love their positivity and trying to keep her spirits up. I'm glad she now has over 16,000 subs, it really seems to motivate her further.